With her parents as chefs, Rachel Linstead grew up surrounded by food so it isn’t surprising that she eventually joined the industry herself. As a technologist in the food production development sector at Unilever, for 7 years she was involved in developing many household products that we still use today. After gaining insight into the science behind food, Rachel later qualified as a personal trainer, eventually becoming senior manager in a health club. In this role, she was in charge of managing a team of 30 and looking after over 3000 members. It was from this role that she got the passion for wanting to help businesses grow through implementing nutrition, positive workplace culture and healthy practices that can help employees thrive. As a highly qualified business and nutrition trainer, advisor, coach and mentor, Rachel’s energy is driven by her love for food and nutrition, and the effect this can have on your life. 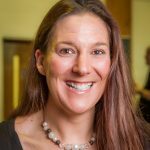 Since setting Firecracker up back in 2011, Rachel Linstead has used her experience and qualifications in nutrition and business coaching to provide support to over 150 businesses, and has touched the lives of over 4500 people. Rachel is currently studying a Masters in Workplace Health and Wellbeing at University of Nottingham to bring together all her knowledge of wellbeing and nutrition and apply it to the workplace as well as gaining new evidence based knowledge in workplace health and wellbeing to ensure the advice she gives to organisation is clear, concise and accurate.